They aren’t giving up so I assume it works to catch the dumb fish. I (again) found “traffic” spikes in Analytics coming from auto-seo-service.com, auto-seo-service.org, autoseo-service.org, resell-seo-services.com only to find that it is our old friends at Semalt. Does this spam even work? Maybe their real purpose it to generate traffic out of your curiosity to visit one of their spam links in Analytics that forwards to their website to improve their Alexa Rank or something. I can’t imagine anyone would do business with someone who uses dirty tricks to advertise “spam advertising” – not cool! So I advise that you don’t give them the benefit of a visit. For those who won’t visit but are curious, search a bit for other webmaster comments. What I have found (and I’m not visiting their site to see what they are pitching today) is they are reportedly a Ukrainian SEO outfit. 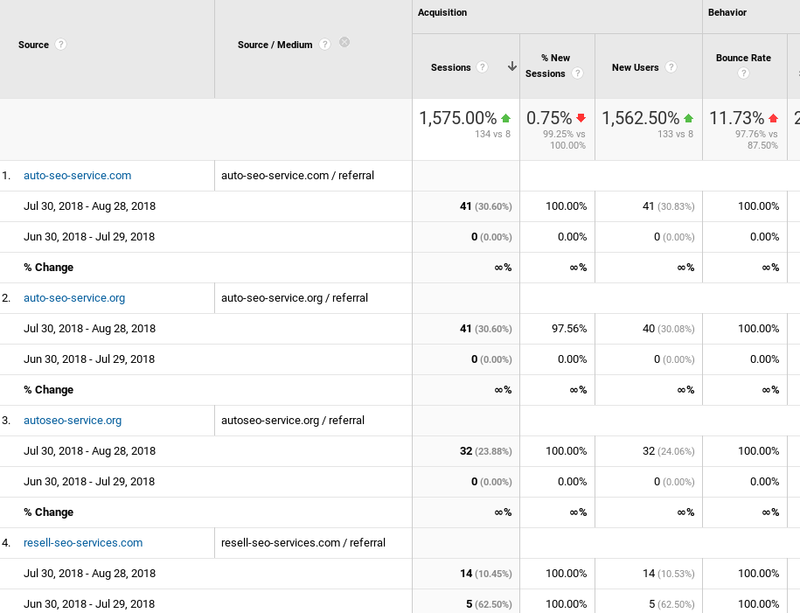 Since this isn’t real traffic (100% bounce rate) you can’t filter them from your analytics. You’ve got to block them at the server. If you have access to your Apache htaccess file, adding this line in mod_rewrite should do it.